Loropetalum is a genus of three species of shrubs or small trees in the witch-hazel family, Hamamelidaceae, native to China, Japan, and south-eastern Asia. The name Loropetalum refers to the shape of the flowers and comes from the Greek loros meaning strap and petalon meaning petal. Flowers are produced in clusters during spring and are similar to those of the closely related witch-hazel. Each flower consists of four to six (depending on species) slender strap shaped petals 1-2 cm long. 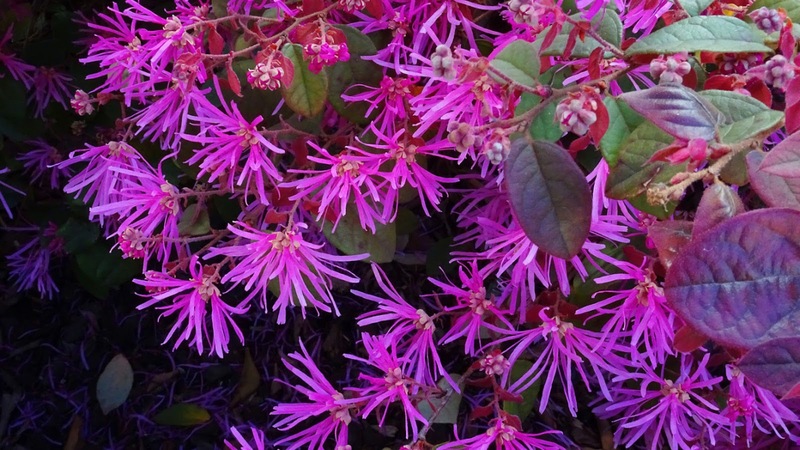 Illustrated here is Loropetalum chinense var. rubrum, often called "Chinese Fringe Flower". Plan your colours to begin with. This particular loropetalum looks great in a black pot for an oriental feel or try a bright contrasting colour for a real statement. As it’s low growing, plant it at the front of garden beds for maximum impact. Loropetalums in general prefer moist but well drained soils but are quite adaptable to less than ideal conditions. Pruning is generally not required, however, you can give a light trim after flowering to help keep them in your preferred shape. A feed with a slow release fertiliser in early spring is beneficial. They are ideal for low maintenance areas, rockeries and garden edges. Love the subtile beauty of this little ones!